Has making DC Circulator free actually drawn new riders? A proposal that would make the DC Circulator permanently free of charge, a move meant to cut down on traffic, could face some challenges getting through the D.C. Council. A proposal that would make the DC Circulator permanently free of charge — a move meant to cut down on traffic — could face some challenges getting through the D.C. Council. The District Department of Transportation hopes free fares will lead to more riders and fewer drivers clogging downtown traffic, but has not released data from the first two months of free fares to support that, Councilwoman Mary Cheh said. “I would like to know more about this decision to make it free and the costs and benefits of it, because, I must say, the more I’ve looked into this, the more skeptical I’ve become of this plan,” she said at a Transportation and Environment Committee meeting Thursday. DDOT Director Jeff Marootian believes the free rides not only expand access to transit options, and provide a boost for some people who may struggle to pay the $1 fare, but also help make bus trips faster since riders do not need to wait in line to pay as they board. “As we continue to operate a free service, we are learning and gathering information about its impacts,” Marootian said. February ridership rose slightly. Mayor Muriel Bowser’s budget for the year beginning this fall proposes adding $3.1 million to the Circulator program to replace money lost due to free fares. The city-controlled Circulator does not have routes in all parts of the city, and Metrobuses operated by WMATA would not become free under this plan. A broader overhaul of the region’s bus routes is planned over the next few years, which would include changes to Circulator and Metrobuses. Bowser’s budget proposal also includes about $13 million to eventually support a new Ward 7 Circulator route expected to connect Eastern Market, Penn Branch and Skyland. Council member Vince Gray was upset the previous Skyland Town Center service was even canceled in the first place. “What’s the rationale for having terminated the Circulator and now we’re going to start it again?” Gray said. Cheh suggested the $3.1 million earmarked for free fares could instead be used to expand service sooner. The Circulator still must find a new maintenance and storage facility to handle the extra buses needed for that and other routes — an effort that has long been stalled. 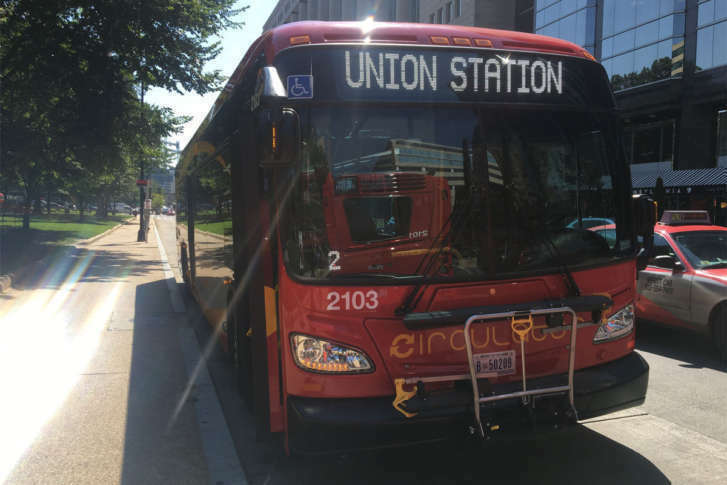 The upcoming changes could be a reason to wait on making free fares permanent, Cheh said — especially since she has heard from people who are now taking the Circulator instead of Metro trains or buses or walking or biking. “This is not incentivizing use of transit; it’s changing it from one form to another, so what do you have — hard data — to tell us for an evaluation whether this is truly incentivizing?” Cheh asked. “It’s our goal to provide as many options as possible, and if we are providing multiple options and somebody chooses one over another, in our opinion that’s what multimodalism is,” Marootian said. Council member David Grosso wants free bus trips eventually, including for Metrobuses. “However, I want to note that I am concerned that this proposal to make Circulator buses free does not appear to have been done in a deliberative and thoughtful manner,” Grosso said. A Circulator driver and a union representing some Circulator workers also raised concerns at Thursday’s hearing about several operational problems. Bus operator William Jackson warned about a lack of training for maintenance workers on the system’s new electric buses, and said he prefers to drive the diesel buses instead. “The streets here in D.C. are very rough on those buses. You hit a bump and it sounds like screws are going to pop out of place any minute and that they’re just going to fall apart underneath you,” Jackson said. Jackson also complained about buses not charging in freezing cold weather and other problems. Marootian said those complaints are not consistent with information he has, but promised to follow up. Cheh agreed it would be part of a broader conversation as the District pushes for more electric vehicles to reduce local pollution. Jackson also called for more maintenance staffing to deal with issues on buses. “Check engine lights, low oil lights, bald tires, loose mirrors and engine shutdown lights have all become too normal in the daily life of the DC Circulator operator,” Jackson said. OPEIU Local 2 said a number of street supervisors are being laid off, and the number of dispatchers is down, which has reduced redundancy in the event of any problems. The union’s second vice president, Michael Spiller, called for more oversight of the contractor that runs the bus system for the District. DDOT took over that contracting oversight from Metro last year. A study of whether the District should move away from contracting entirely and simply operate the Circulator fleet itself is due to be completed this summer.